1. 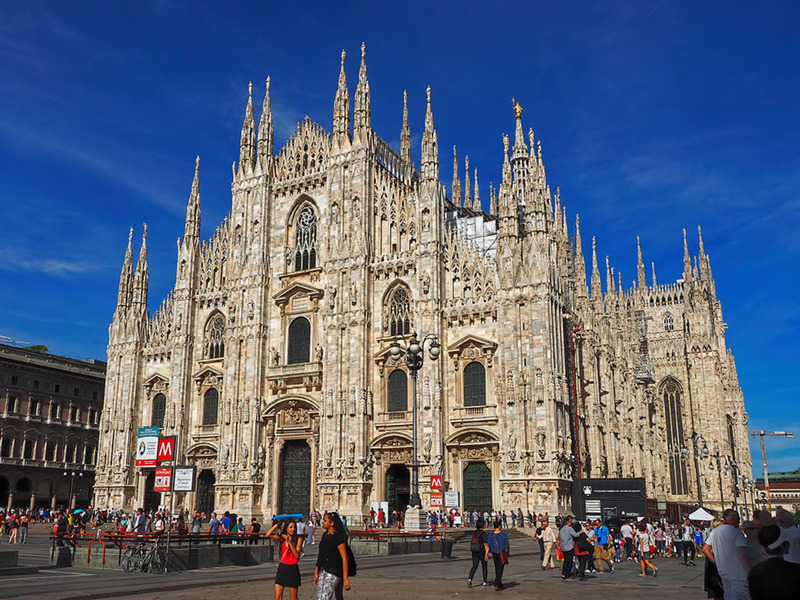 Be inspired by The Last Supper Leonardo da Vinci’s The Last Supper is undoubtedly Milan’s best-known attraction, but tickets are almost as hard to get hold of as front row seats for a Prada fashion show. Those lucky enough to enter the hallowed refectory (attached to the church of Santa Maria delle Grazie) get 15 minutes to examine the expressions of consternation, hostility and despair on the faces of the disciples, just as Jesus reveals his imminent betrayal. Thanks to Leonardo’s experimental technique, the fresco is famously flaky – but that doesn’t detract one iota from the experience of seeing it in the ‘flesh’. 2. Take in the view from the Duomo roof 500 years in the making, the spiked gothic cathedral that is the Duomo has been compared to a wedding cake and a ‘hedgehog’ (D.H. Lawrence). Its imposing interior contains some magnificent treasures but, for a truly breathtaking experience, climb the 150 steps (or take the lift) to the roof. Here, visitors can admire some of the 3,600 statues and 135 spires, many carved from pink Candoglia marble – and get a closer view of the famous gilded copper ‘Madonnina’ atop the tallest spike. On a fine day, the view stretches far beyond the city to the snow-capped Alps. 3. Get some culture at the Teatro alla Scala Typically Milanese, the discreet, neo-classical façade of Teatro alla Scala, the world’s most famous opera house, belies its opulent interior – featuring acres of red velvet and gilded balconies. Tickets to world-class opera and ballet performances aren’t as hard to get hold of as you’d think, if you’re prepared to be flexible about seating. Look out for a superb programme of popular operas throughout 2015, under new musical director Riccardo Chailly. 4. Hop on (and have dinner) on a tram Synonymous with the city and a piece of living history, Milan’s original yellow and orange 1920s and 1950s trams have varnished wooden seats and iconic fluted glass lampshades. Today, the city’s rolling stock also includes 1970s models and the new-fangled, dark green ‘caterpillars’ – but for a taste of the original version, hop aboard the number 1, taking in some of Milan’s most symbolic monuments as you go. Alternatively, book an evening ride on ATMosfera, a vintage tram serving up dinner with wine, run by the ATM transport authority. 5. Step into a time capsule at Villa Necchi Campiglio Far from the madding crowds on Milan’s thronging streets, the beautifully-preserved 1930s Villa Necchi Campiglio transports visitors into another world – where glamour, good manners and immaculate taste reigned supreme. The backdrop to the 2010 film ‘I Am Love’, starring Tilda Swinton, the house contains original 1930s furniture by architect Piero Portaluppi and wardrobes still crammed with the former owners’ fabulous designer clothes. Take a tour, then relax in the garden café beside the outdoor swimming pool. 6. Visit some classic art galleries… Thanks in part to Napoleon, who dumped much of his northern Italian loot here, the Pinacoteca di Brera contains one of the most important art collections in Italy. Treasures include the eerily realistic Dead Christ by Mantegna, and Supper At Emmaus by Caravaggio. Smaller but with works every bit as important, the Pinacoteca Ambrosiana houses The Musician, an early painting by Leonardo da Vinci, and a lock of Lucrezia Borgia’s strawberry blonde hair. 7. … But leave time for new collections too Milan’s oldest galleries may have been around for centuries; but these days they have rivals in the form of Museo del Novecento and Gallerie d’Italia – both inaugurated since 2010. As its name implies, the Museum of the Twentieth Century houses 20th-century Italian and international artworks, by everyone from Modigliani to Matisse. The free, bank-owned Gallerie d’Italia displays masterpieces by the likes of Canova and Hayez in a sumptuous series of frescoed palazzi, opposite La Scala opera house. 8. Shop in style at the Galleria Vittorio Emanuele With its glass-and-iron dome, magnificent mosaics and marble floorways, the Galleria Vittorio Emanuele arcade is definitely one of the world’s most glamorous (and oldest – it was built in 1867) shopping malls. Among its claims to fame is the planet’s first-ever Prada store, here since 1913. Gucci, Louis Vuitton, Armani – and most recently, Versace – all have a presence, but most visitors come to spin their heels in the famous bull’s testicles, part of a floor mosaic it’s said to bring good luck. 9. Discover Michaelangelo’s unfinished masterpiece Its rounded turrets, spacious courtyards and secret passageways would be reason enough to visit this renaissance castle – but the Castello Sforzesco also happens to be home to one of the city’s most precious, yet often overlooked, artworks: Michelangelo’s final, uncompleted sculpture, the Pietà Rondanini. In 2015, the sculpture will be moved to a new, purpose-built display area at the castle and shouldn’t be missed. 10. Get in with the in crowd at 10 Corso Como Since its opening in 1990 in a rambling converted garage, the whimsical fashion and design emporium that is 10 Corso Como – with bookshop, café, restaurant, B&B and gallery – has become an essential port of call for anyone with the vaguest of interests in the fashion industry. Owned by former Vogue Italia editor Carla Sozzani, its interiors feature swirling, organic furnishings and monochrome abstract patterns that add up to a magical take on fashion land. Prices aren’t for the faint-hearted – but you may uncover the occasionally affordable notebook or accessory: snap them up, if only to get hold of one of the shop’s beautifully designed paper bags. 11. It’s all a trick of the mind at Santa Maria presso San Satiro Tucked between the ubiquitous chain stores on via Torino, the unassuming church of Santa Maria presso San Satiro hides another of Milan’s unmissable sights. Walk through the door, and you might presume that the gilded apse at the end of the barrel-vaulted nave stretches back for at least two or three metres. Get up close, and you’ll see it’s a trompe-l’oeil niche, with a depth of just 97 centimetres. The great architect Bramante is said to be responsible for this brilliant visual trick. 12. Patronize the Sant’Ambrogio Frequently overlooked in favour of the Duomo, many residents say that the church of Sant’Ambrogio – dedicated to the city’s patron saint – is Milan’s most important religious monument. The red brick exterior may not be quite as eye-catching as the Duomo’s, but visiting the ancient interior is an illuminating experience. Watch out for the Golden Altar, a 9th-century masterpiece of Carolingian goldwork, and the Stilicone Sarcophagus, a late-Roman funeral receptacle, said to have been made for a Roman general. Don’t miss the grisly remains of Sant’Ambrogio, housed in a bronze and crystal casket along with two other saints, in the crypt. 13. Lunch with the locals at Luini You’ll know you’re entering Luini Land when you see the crowds of youngsters crouching on doorsteps on a backstreet beside the Duomo, clutching greasy paper bags. On weekends, the queue snakes right down via Santa Radegonda. Come to this hole-in-the-wall take-away at off-peak moments to try the legendary panzerotti – a fried pastry triangle stuffed with tomato and oozing mozzarella – originally from Puglia, but definitely one of Milan’s most recognisable treats. 14. Find something precious in the Golden Rectangle Purveying hot-off-the-catwalk clothes by the likes of Armani, Dolce & Gabbana, Prada and Versace, it’s little wonder that Milan’s upscale fashion shopping district is known as the Quadrilatero della Moda – the Rectangle of Gold. The merchandise at most of the area’s shops is most definitely not for those on a budget, though you can always poke your noses into DMagazine Outlet, a discount fashion shop on via Manzoni, or simply enjoy a spot of window shopping, whilst clocking the well-dressed fauna that inhabits these style-conscious streets. 15. Navigate the Navigli waterways A network of canals, partly designed by Leonardo da Vinci, once stretched right across Milan, but these days the Navigli are confined to two long waterways – the Naviglio Grande and the Naviglio Pavese – in the city’s south. A welcome alternative to the slicker style associated with the fashion-obsessed centre, the bohemian canals are lined with pavement cafés, vintage shops and the occasional gallery. A popular antiques market is held on the Naviglio Grande on the last Sunday of every month. 16. Take a seat at Studio Achille Castiglioni A hidden gem close to the Castello, the tiny Studio Achille Castiglioni museum was once the studio of legendary Milanese furniture and industrial designer Achille Castiglioni, who died in 2002. Shelves are crowded with gadgets, models and inventions; secret drawers and cupboards reveal some of the inspirations that led to his most ingenious ideas. Ask to see the miniature model of Castiglioni’s iconic Arco lamp for Flos. 17. Be part of the furniture at Salone del Mobile With more than 350,000 visitors from 160 countries, April’s Salone del Mobile (Furniture fair) is the biggest annual event in Milan. Designs from the 1,270 exhibitors at the main Fiera Milano trade fair in Rho (open to the public at weekends) range from the understated to the bizarre. But what makes the event worth coming to are the hundreds of exhibitions, cocktail evenings and parties at the Fuori Salone fringe back in town. Most are free and open to anyone. 18. Score at San Siro Stadium First built in 1925, and expanded for the World Cup in 1990, the San Siro Stadium is home to two of Italy’s most famous football clubs: FC Internazionale and AC Milan. With sound reverberating around the ringed stadium, watching a match at San Siro is an unforgettable thrill. But if that doesn’t prove possible, take a tour of the museum and stadium on a non-match day. The highlight is a peek inside the dressing rooms – revealing the contrasting philosophies (both sporting and political) of each squad. 19. Marvel at the Unicredit Building For many residents, Cesar Pelli’s Unicredit skyscraper is the new symbol of Milan. Erected in 2011, its illuminated spire evokes the Duomo, whilst stretching its height those extra few inches, making it Milan’s tallest building at 231 metres (758 feet). Some say the bank-owned building epitomises the city’s spiritual emptiness and dependence on ‘dio denaro’ (the money god), responsible for the crisis that has swept through the city over the past few years. Others feel it’s a symbol of progress, displaying the city’s reluctance to get trapped in history’s sticky net. 20. Explore (and eat) at Expo 2015 Mired by corruption scandals, chronic tardiness and escalating budgets, the build-up to Milan’s Universal Exposition (1 May-31 Oct, 2015) has been controversial, to say the least. Yet the high-minded foodie theme (‘Feeding the Planet’), a wealth of creative ideas from the 144 participating nations, and a rich programme of supporting events around the city promise to make this an event not to miss. Among attractions are pavilions by Norman Foster and Daniel Libeskind, an installation by Wolfgang Buttress, and the largest exhibition of Leonardo’s works ever held in Italy. If nothing else, it should be a great excuse to devour some mouth-watering international nosh.